Every legendary hero should have a named sword. Just think of Arthur and Excalibur, Roland and Durendal, Chrysaor sword of Sir Artegal etc. And, now, thanks to the page Celtic Mythology that I have only recently subscribed to on Facebook, the Moonlit Knight has found his. FRAGARACH the ‘Answerer’ or ‘Retaliator’ was the sword of Manannan mac Lir and later, Lugh Lamfada. Forged by the gods, Manannan wielded it as his weapon before passing it on to Lugh, his foster son. 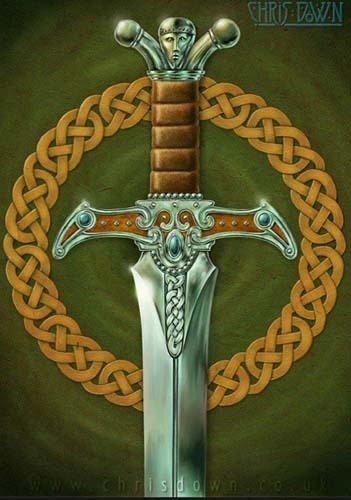 It was given to Cúchulainn by Lugh, and later to Conn of the Hundred Battles. It was said that no one could tell a lie with Fragarach at his or her throat, thus the name ‘Answerer’. It was also said to place the wind at the user’s command and could cut through any shield or wall, and had a piercing wound from which no man could recover. What better weapon for a seeker of truth and may he also prove worthy of bearing it.